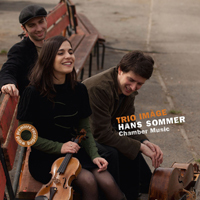 HANS SOMMER (1837-1922): Piano Quartet in G Minor, Piano Trio in E Flat, Violin and Piano: Gavotte, Op. 41, Romance in C Sharp Minor, Vanished Joy in E Minor. Description: Sommer’s chamber music œuvre may amount to just these five pieces: two full-size (the trio and quartet are both in the 26-28 minute range) and three miniatures. The quartet dates from around 1870 and was revised the same year he wrote the trio (1884) and both are in the expected Schumann-Brahms lineage, are both ear-catchingly melodic and permit us to recommend him into the Herzogenberg division of forgotten German Romantics. Fittingly, the winsome little three-minute Vanished Joy is Sommer’s swan-song, written in 1921. Trio Imàge w/Hartmut Rohde (viola).